What an unusual grid! Not symmetrical and with so many short clues! We are going to discover a group of four artists and four of the artists’ works ‘discoloured’, then there’s a very promising ‘grid shading instruction’ in store for us that will ‘rectify one of the omissions’. Clearly we are going to colour one of those ‘works’, so I smile and get my pencils ready. First, of course, I confirm Nudd’s right to retain his topers’ club membership card and he doesn’t disappoint. He starts off in Indiana, ‘Public houses within Indiana succeeded (4)’ giving IN [I]N + S. He’s there for the cocktail. ‘Trusting cocktail of elaterin (7)’ giving RELIANT with an extra E. I have to see what cocktail he’s on and Chambers tells me elaterin is a purgative produced by the juice of the squirting cucumber. Oh dear! Soon we find ‘Fools consuming European ales, say (5)’ giving us BERKS round E – BEERS with an extra K; a slight improvement on the elaterin but it doesn’t last. Two clues further down we find ‘Water jug to remain away from tepid beer (4)’ That’s BE (remain) extracted from LEW BEER leaving EWER. OK, we have a jug now but the beers seem to have become tepid. There’s a little hope when we find ourselves in CAFES, ‘Diners, wine flasks less accepted (5)’ CA[R]AFES less A(ccepted) but shortly he’s back on the ales and turfed out of the cafes. ‘Doctor’s rival drinks in dock (5)’ (It was a lovely little clue though wasn’t it? ALE[S] in DK giving DALEK, Dr Who’s rival). I’m despairing for Nudd until a gleam of light, Islay, appears in the last clue but hope is dashed. ‘Islay’s more weak when grain free (3)’. We take the GR from M[E]AGRE and find MAE – Islay’s ‘more’. I’m not sure we’d want much more grain-free Islay malt, but it was another fine clue wasn’t it? Our grid is rapidly filling and we have spotted our group of four. BEADLES changes to BEATLES, providing the one-cell clash and our extra letters spell out (with my additions) WHITE ALBUM, BLUE JAY WAY, OLD BROWN SHOE (familiar but not our old favourites, ‘Imagine’, ‘Yesterday’ or ‘Let It Be’) and YELLOW SUBMARINE (we who frequently fly through Liverpool Airport with its horrid smelly carpets are so familiar with that! ), then the instruction MAKE LETTERS OF TITLE YELLOW, THE REST BLUE. It’s all fun from that moment on and how realistic Nudd’s portrayal of that oh so familiar record cover is! 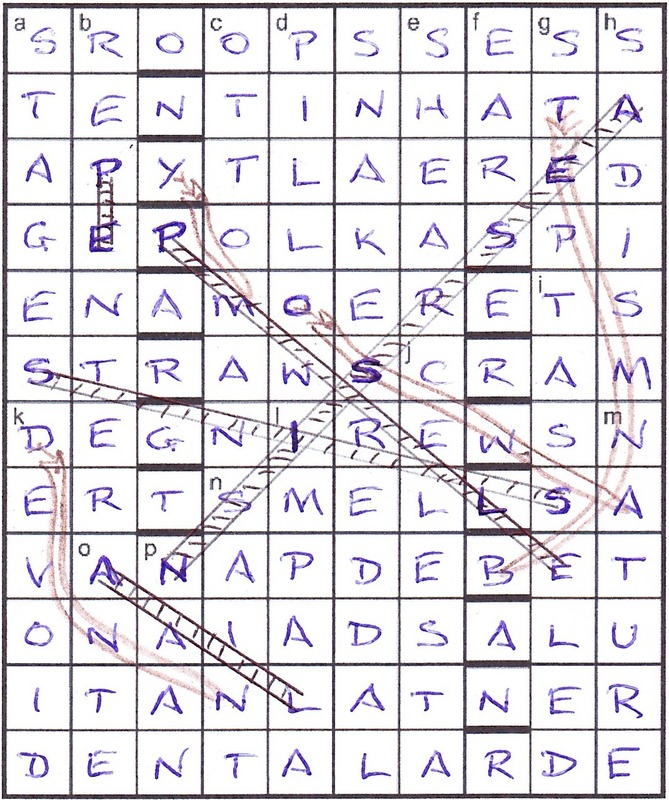 I love puzzles where we have a clear instruction that leads to a cheerfully coloured grid – give me a set of approachable clues that lead to a coherent message and a familiar picture any day in preference to a double Playfair or a carte-blanche with jumbles where letters leap from clue to clue. (The only thing missing was that the Yellow Submarine wasn’t torpedoing a Playfair square!) Thank you, Nudd. Xannthippe’s last puzzle was only nine months ago and was the very enjoyable game of golf in which he allowed us to beat him 2&1. When I first saw the grid in this week’s puzzle, two thoughts crossed my mind: how was I going to describe it in my Crossword Database , and how difficult would my animation end up being! From the preamble, it looked like we were in for a novel solve. There were three thematic answers in each quadrant clued by wordplay only and entered as suggested by an extra word in one of them. 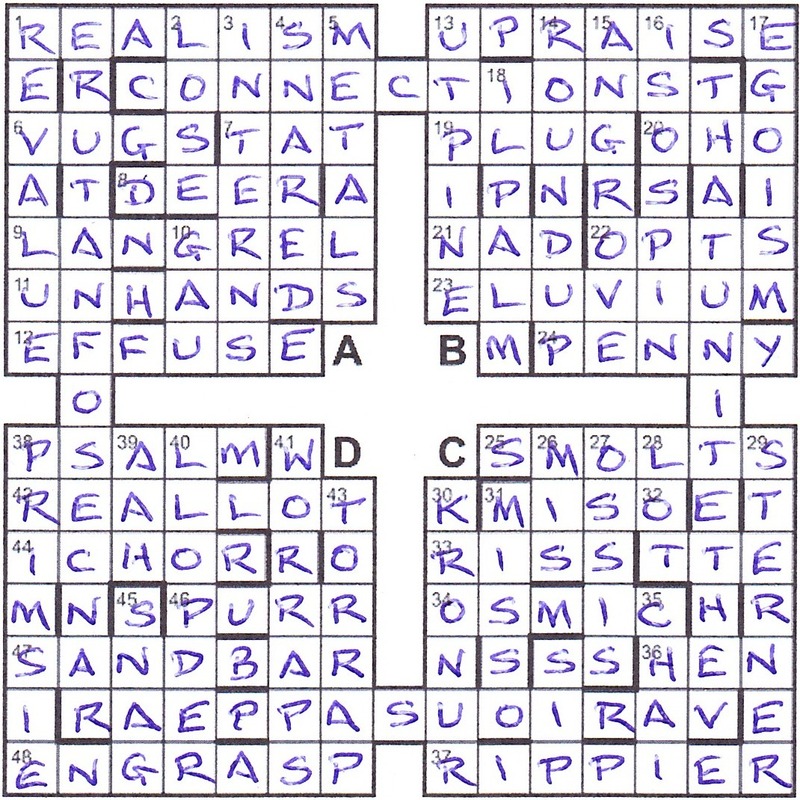 Moreover, the remaining cues in each quadrant had a different gimmick, quadrant A requiring us to remove two letters before they could be solved. That would reveal how to deal with quadrant B, which in turn…, well, you get the picture. Each quadrant would need to be solved independently, since they were connected to each other by a single cell which formed part of an unclued entry. Quadrant A clues were reluctant to be solved. 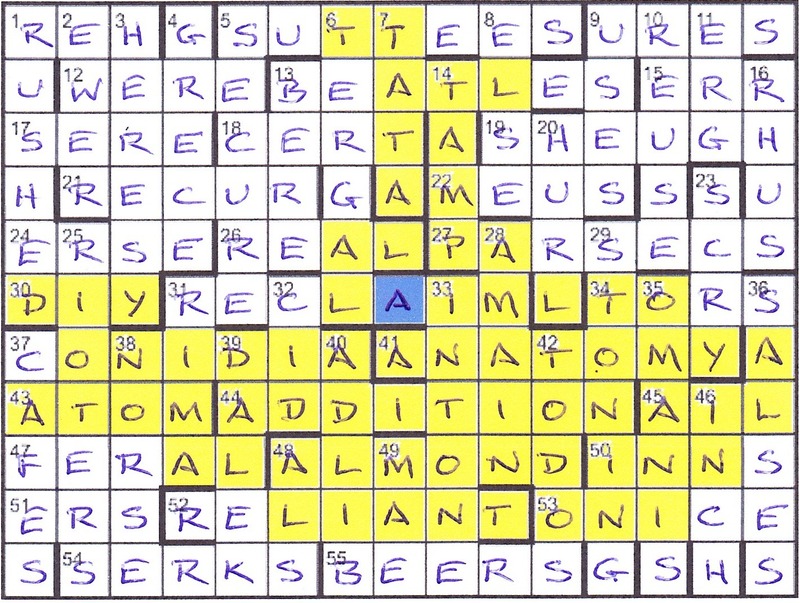 This was primarily down to the devious requirement to remove two letters, not necessarily consecutive, before solving. The first two I cracked were 12ac Iron mover to wield discharge (6) — Iron over to weld discharge (6) — giving EFFUSE, and 10dn Grand arena turn’s opening German district (3) — Grand area urn’s opening German district (3) for GAU. The two letters dropped were MI and NT, and I immediaely saw that quadrant B would involve misprints. Not that that would help me with A, so I persevered and had it finished in 45 minutes. The three thematic answers in this quadrant were all fish — SOLE, SANDER and SAMLET, and the extra word in 2dn told us they had to go swimming, so were anagrammed into LOSE, SNARED and METALS. I particularly liked the clue to 8ac Eg, role with stage actor making return (4) where L and E were dropped (although I wondered why Oliver REED was described as a stag actor before realising that stag was part of the definition!). Also, I felt sure that Boarders in wipeout in 3dn would end up being Borders in wipeout, WT. On to quadrant B clues where we had to Amend a letter misprint and we were in familiar territory. These were somewhat easier, and getting 13ac UPRAISE set me on a good start. I wasn’t sure whether the original letters and corrections in the misprints would be relevant; in fact, it would just be the corrections. For some reason, I liked 21ac Some vitamin E, dense coenzyme (3) which needed vitamin E changing to vitamin A to reveal NAD (the abbreviation mentioned in the preamble). I’ll call that a ‘misprinted hidden clue’. And of course, 16dn I will square ratio, neutron quantum number (7) was a doddle since we had ISOSPIN just a few weeks back. And so the thematic answers in this quadrant were trees — NUT PINT, MANGROVE and OIL PALM, all to be pollarded and entered without their first letter. That went slightly quicker than the first quadrant, about 40 minutes, and quadrant C simply required us to Add a letter before solving. The smart ones among you would have twigged the theme for this quadrant from 26ac Meandering wife drinking, no good leaving (11), with meandering being a dead give-away as the extra word. Unfortunately, I was on the lookout for birds, mammals or plants, rather than rivers. Of course, the somewhat confusing numbering stopped me in my tracks and I wondered if Afrit had been at work! The clues were quite solvable with 33ac Icy period — girl ditches Ike for Romeo (4) being my favourite with MISS having Mike being replaced by Romeo. I also liked 27dn Ancestor of CI, Iceland or East Germans (5) which had nothing to do with Guernsey or Jersey but the CIA. At some point, 32dn OTTER steered me even further away from rivers. In hindsight, I’m sure this was a deliberate red herring from Xanthippe. Even so, I should have got 31dn sooner Me drinking one southern whisky and lime? (8) even though I like neither whisky nor lime (MI containing I S SOUR). MISSISSIPPI was the final one that wended its way through the grid. The instruction for quadrant D clues was Remove a word, and a quick scan of the clues suggested that we had to Complete quote using letters… in the endgame. 41 and 43 down finally gave me my birds SPARROW and PARROT with REDPOLL also coming to light at 40. This had to be entered upwards as determined by up in 43. There remained one outstanding clue to be resolved, 40dn Prone to vote Republican on a register (7) which led to REDPOLL. This seemed to be double wordplay, the second being RED (Republican) + POLL (a register). However, I was stumped by prone in the first half of the clue. My entry was posted without sussing it. And I’m still stumped! All in all, about 2½ hours for this enjoyable puzzle from Xanthippe. But please, a nice simple grid next time! I seem to be constantly running late with my Listener solving, and I only got around to this on the Saturday a week after publication. It was 7am. It was also the day of our occasional Listener get-together in London, and I didn’t want to turn up without having cracked this puzzle. It was Serpent’s first Listener, although he’s had about half a dozen elsewhere. The preamble told us that we had to deduce the location and entry method of the across answers, all of which were 6-lettered and apparently listed in a logical sequence. I decided to give them a quick once-over to see how easy they were. Despite getting 1 DENTAL and 2 LARDER, only another half dozen came forward. I wondered if there were common letters between successive answers, but knew that was unlikely to help identify their location. I must admit that the clues were a bit slow coming, but after about 90 minutes I had •n•••s•nd•add•rs, and knew we were dealing with the children’s game of Snakes and Ladders, or as Americans would say (always different, and hopelessly PC) Chutes and Ladders. I could leave for London feeling happy. The following day, all the snakes and ladders could be utilised to fill the grid running logically from bottom left to top left. Entries overlapped when they ran consecutively. There were five ladders and four snakes on the way, not to mention some tricky clues to resolve. I particularly liked clue a The ultimate pair of cojones is framed by dog’s legs (6) with its sneaky definition for STAGES. Thanks to Serpent for some entertaining childhood reminiscences. And not for the first time this year, I pitied JEG having to check that all the ups and downs were drawn correctly. Also, apologies for my somewhat pathetic drawings of snakes, but I’m sure Shirley will make up for it.